To some, I may appear productive. But like many, I’m a horrible procrastinator. I try to think about my weakness in positive terms, e.g., “I work better under pressure.” That is true—I believe there’s nothing like a deadline to force you to be creative (one reason why I love blogging!). However, for some projects, I know that if I had budgeted my time better, I could’ve produced superior work, rather than passable or “good” work. Recently, I’ve devised a system that has all but ended my horrible procrastination. I’d like to share it because I know I’m not unique, and most procrastinators enjoy discovering new “cures” to experiment with. Step 1: Start with a master list. You probably have a master to-do list. If you don’t, create one. Here’s a form I created that limits your to-dos to one week. If you have to-dos that stretch out further than a week, it can become overwhelming and meaningless. In the case of to-do lists, it’s best to stay in the moment as much as possible, to guide your most immediate work. That said, if you need a reminder about a future project or deadline, put that on a different list or create a reminder/alarm. On my own worksheet, I have something called the “parking lot” that is exactly for those things too far out for me to attend to. Writing them down helps free my mental energy, so I can focus on other things. You’ve just listed massive projects that need smaller action steps. For big projects, create a separate project list that breaks everything down into small action steps. This is really important! If you don’t have a specific next task you can easily tackle, you will procrastinate because you feel overwhelmed. It will induce paralysis. Repeat after me: Break down each project into its smallest possible components. Step 2: Using Post-It notes, break up the week’s tasks by day. Breaking up the tasks by day prevents you from saying, “Oh, I’ll get to that tomorrow.” This is important! I used to work off a master to-do list that was never-ending. Often I felt paralyzed by the amount of work I could select from; I didn’t know what to tackle first, so I delayed and did nothing. I waited for the nearest deadline to compel me to action. But when you have the whole week outlined, and you’ve strategically master-minded everything on Sunday or Monday, with all the tasks segmented by day, you feel you have things under control. You budget your time better. You get into a rhythm. Hint: I used to create one-day lists, not one-week lists. Once I switched to the one-week view, I became FAR more productive. Why? With one-day views, it was VERY easy for me to say, “Oh, that’ll get done tomorrow.” When I have a set of NEW tasks already outlined for the next day, I’m far less likely to make excuses. I need the week’s big-picture to keep me motivated and focused. For tasks that are more time-consuming, break them up into Parts 1, 2, 3 (etc), and schedule them over the course of the week. This gives you permission to jump around your to-do list, keep things interesting, and make the difficult tasks more manageable and approachable. It’s best to have your Post-Its in the center of wherever your work. I put mine right on my laptop. When and how could this system fall apart? If you have tons of stuff happening on a particular day, you may never get to your to-do list. Give yourself light task days whenever you have tons of meetings, errands, etc. When I worked in publishing, my to-do list was often dictated, to the minute, by incoming e-mails and social media blips. It didn’t allow me to focus on higher level tasks. This can be a tough problem to solve. Eventually I had to make a tough decision that I sometimes still enforce: No checking of e-mail until after 4 p.m. (or some other specified hour), or until certain tasks are complete. Your life will not be your own if you’re constantly getting whipped around by your inbox. If you’re not strategic about which day you schedule tasks, you could still end up procrastinating. For more time-consuming tasks, I break them up into parts (as suggested above), and start the process early in the week. That way, if things take longer than anticipated, I can adjust the schedule before it’s too late. Your to-do list is only as good as your ability to keep track of important deadlines and to prioritize. For me, the issue has never been one of awareness or prioritization. It’s been focus, direction, and motivation (especially to tackle more daunting projects, or those I’m avoiding). What secrets do you have for overcoming procrastination? Share in the comments! Posted in Creativity + Inspiration, Work-Life. I was struggling with my current task list, as it has become obvious that I am not getting anything done in a timely manner. 😀 I think I suffer from the illness of “put everything on the list at once.” Thank you for this worksheet and tips. I can’t wait to try it out. This was very helpful. I am an inverterate list maker. But sometimes I get overwhelmed by those lists and end up like a whirling dervish — lots of energy expended little accomplished. Agreed. More lists doesn’t mean more stability! I love lists! I keep a small notebook with me where ever I go. I have a white board in my apartment with many colored dry erase markers. I also have sticky notes on my laptop. With all of this, I still procrastinate. =/ I am going to try and take your advice and only make week long plans. Thanks for a great post, Jane. Thanks, hope it works for you (or at least helps you find your own method)! I like this system, particularly the bit about what might affect my ability to get things done. (I’ll resist the temptation to say ‘life’). I’ve taken the liberty of downloading your sheet to see if it would work with me. It may be the most timely of things as we are moving from England to France. It could be a life-safer. Yes! Sometimes recognizing/understanding the pitfalls or drivers of procrastination are the key to overcoming it. You are speaking my language here, Jane. Too much to do causes me to freeze rather than try to sort it all out. Thanks for sharing the worksheet and post-it ideas. I’ll give it a shot! Excellent! Hope some aspect of it works out for you. I’m going to try this with the post its on the laptop. Thanks! Having those lists right in front of me has been important. Anything hidden away means I’ll never look … ! 1. The single biggest distinction in effective planning is the difference between projects and actions. “Build a website” is a project that calls for many small, physical, visible actions (“to-do’s”). Keeping a separate list of projects gives you the big picture of your life. 2. View your to-do’s by the week. I just keep a list of all to-do items and boldface the items to complete in the upcoming week—different than your system, but based on the same idea. P.S. You are so prolific, it’s still hard for me to believe that you procrastinate. P.S. I wonder if it’s just that I have more time on my hands than most … (no kids, no family obligations, etc) … ! I use a series of lists for another reason: they keep me from overestimating what I can do in a day. I may make a list and then say, “Hmm, that looks like too much. What can I move to another day?” I get less overwhelmed this way. I also will put time slots next to my daily tasks so that I make sure I don’t waste time or get carried away on one project at the expense of another. At the end of the day I usually feel tired, but satisfied. Absolutely! It took me years to stop feeling bad about leftover to-dos … it was mostly a matter of expecting to accomplish too much in the time I had. You really gave me a savvy work tool here! I am going to start laying out my first week of tasks today, as this is my light day for work around the home. NOW maybe I will complete my National Novel Writing Month challenge this year! Thanks for sharing this today. I really was struggling and looking for a solid way to organize myself! I’ve always thought NaNoWriMo is a great experiment for anyone to see how and if you can get work done … Usually it’s by consistently completing a series of small, achievable tasks. Greg, you’ve just described my life in corporate America. I found it very unsatisfying, but it didn’t seem there was any other option at the time. But I’m sure you’re aware of the Covey framework, how he divides tasks into 4 quadrants? I don’t work like Covey recommends, but his overall point is a good one: The more your life is driven by urgent-necessary tasks, the less you get to focus on stuff that’s not deadline-oriented, but possibly even more important (in the long term) than the urgent stuff. LOL! I may be organized, but it doesn’t help with the procrastination. I also tend to be so focused on the moment that I let the bigger picture things get away from me. Breaking big things into a smaller sequence of tasks is the best solution for me. I love this idea. The number of projects that seem to get stuck up there in the ol’ noggin can make it all very overwhelming. I’m a huge weekly “to do” list person anyway, but this helps break it down and organize it a step further. Thanks, I’ll be sharing this! Yes! Whenever I have an overwhelming feeling of anxiety, it’s usually because I haven’t listed all the things I’m trying to keep mental track of. My secret to procrastinating is working with Sean Platt, but not everyone has that tool.I love Step 2 and the post its on the lap top. Genius and so obvious. There are so many great take aways in this post, but the visual made me say AHA! out loud. Thanks Jane. I am learning a lot from you. So helpful and it’s something that with a decent dose of self-discipline is totally doable. My lists are also on post-its sometimes. Setting a simple yet effective system is what I’m committed to do! Thank you for sharing your system, Jane! I have a pretty close variant to your system. I use my calendar function in my email (with a hard copy on my wall) to help schedule and “clear out” those further deadlines; it helps to see that I have breathing room for some things. The weekly master list I do could use some tweaking and breaking down, but oddly, sometimes a task is less overwhelming when it’s bundled on the master list and broken down into a checklist. Having lots of lists seems crazy, but it really is the key. Great post. I’m writing this comment right now and not putting it off until later. For tasks I’ve been avoiding or don’t really want to do like…organizing my taxes, I set a timer for 20 or 30 minutes and give myself permission to stop when it rings. Sometimes I stop but most of the time I’m in a groove and keep going. It helps. I love that too. Only I tell myself: 5 minutes and you can stop. Of course I never do. Thanks, Steven. I am, in fact, an owner of GETTING THINGS DONE. Have never been successful with electronic lists, though, and I’ve been trying for 5 years. Will check out the Pomodoro Technique! intentions but little follow through. Thanks for taking the time to comment, Roberta! As you point out, though, it’s a pretty big issue … ! The fact that you respond to all of the comments gives us followers more incentive to write you our ideas. Your responses makes us feel, and KNOW, that you do indeed read our thoughts. This contact makes your blog more personal. Interestingly, I don’t think that many beginning bloggers understand this psychological motivation, and they don’t understand why people don’t leave comments. Of course there are other reasons. But this is a big one. This sounds exactly like me it is scary. I do all the lists and schedules yet I still find I am lacking motivation and procrastinating. But reading this and seeing it is a common problem is very reassuring. Time to get the lists working for me instead of against me. Great post. Scary, but effective: Make a commitment to someone important. More accountable than a self-directed deadlines. i.e. Commit to a date for guest posting on a blog or schedule a school visit or advertise your course dates. Yikes! Great suggestions here. I have been using your download of the weekly overview and find it very helpful with post-it note supplements. I have so far stuck to my memoir manuscript production schedule, but I find I am developing very tight shoulder/back/arm muscles. Suggestion for a new blog post–how to write and do social media 4-8 hours/day without developing tendinitis, carpal tunnel, or rigor mortis! LOL! I recommend a massage therapist! Thank you, Jane! I’ve wondered how you get so much done. I think I’ll give this system a try. I’ve gotten into a season of work that is demanding so much that I’ve forgotten some important things lately. (The poor couple who flew into town and we were supposed to meet and take out to dinner, for one!!!) This should help. Oh dear! I don’t know if my system is very good for important reminders (I tend to use iPhone & calendar alarms for super-critical activities), but perhaps the list-making and day delegating can free up some mental space/focus either way. After babysitting my grandsons for a week, this tip is exactly what I need to get back to productivity and lose my sense of being overwhelmed. Thanks! Awesome! Thanks for taking time to comment. Thank you for this! It’s something I’ve struggled with for a long time, and my response has been to make multiple, seemingly endless to do lists that wind up becoming pointless and then make me feel like I haven’t accomplished enough because I’ve barely gotten through them. Gonna try your weekly system and see how it goes. Flattered you found something useful in this! Appreciate the comment, and hope to hear how it goes. Been a life-changer for me! Hope it works for you, too. I started creating categories on my to-do list: the absolute must-dos that have deadlines attached to them, and then I base the rest of the categories on certain moods. If I’m feeling creative, I’ll work on my writing project section. If I’m feeling chatty, I’ll work on my social networking tasks. If I’m feeling as if my focus is going to be an issue, I work on the little things on my list I know will give me instant gratification, such as market research, organizing my office, etc. Great column! I found a list by playwright Henry Miller that advised: When you can’t CREATE, you can WORK. So when I’m not feeling the creative juices, I have a list of things I can do that don’t require a lot of focus — writing the bibliography, for example. On writing and productivity: do you have a Not To Do list? Don’t Pull Your Hair Out, Get Things Done! Love this post Jane. For some reason I am unable to open either link to your worksheet form. Maybe give it another try? I’ve tested the links and they worked OK. Thanks, Jane! I’ve been wanting to look for ways to conquer procrastination, but was too good at procrastinating… 😉 Now I’ve no excuse! Very pretty picture, by the way. Cheers! Great post. Thank you for sharing these tips. 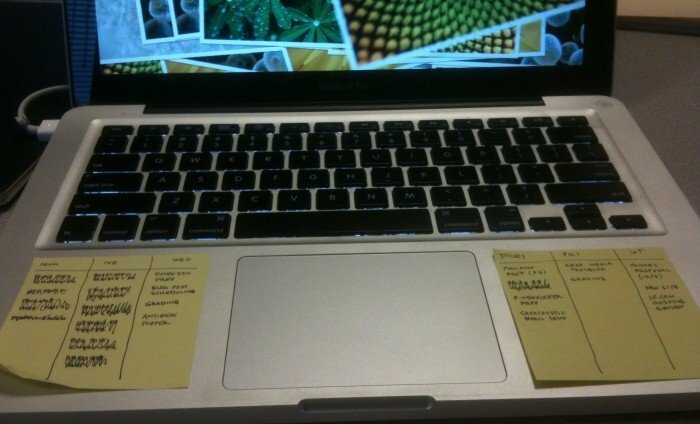 I practice daily to-do lists with sticky notes I post on my laptop. I also have an infant who helps me make the most of my day because my time is determined by his nap times. lol. Love the advice, thank you but your link to the form isn’t working anymore?